Joe was born in Lima, Peru. At the age of one, he and his mother were taken to a detention camp in Crystal City, TX to be reunited with Joe’s father, who was kidnapped by the US Govenment to be used in a prisoner of war exchange for US citizens being held by Japan. Gratefu11y, Joe and his family were not exchanged, but spent three years in Crystal City. After release from the detention camp, Joe’s family, including two sisters born in Crystal City, came to Denver. Joe served in the United States Army and retired after 20 years of service. He experienced his second retirement from Kaiser Permanente Colorado, after working 17 years full time and five years part time, specializing in Pediatric Orthopedics and Hip/Knee Total Joint Replacements. In his retirement, Joe is involved with two separate Ukulele groups: Humu Humu at the Tri-State/Denver Buddhist Temple and Wahines and Kanes at Simpson United Methodist Church. Both groups perform at the annual Cherry Blossom Festival at Sakura Square and other venues. Joe is an avid skier and, with the encouragement of his wife Jill, has also become a regular walker. The couple have taken many trips to foreign countries and Hawaii involving hikes of six to 14 miles. For Richard, the most rewarding aspect of being a member of the Sakura Foundation board is the ability to connect with talented and concerned colleagues serving the J/JA community, with the common goal of celebrating the JA heritage, culture and community. He finds it gratifying to see so many members of the younger generation taking a genuine interest in continuing and expanding on these common goals as well. Richard is very involved in the JA community. He is a member of the Japanese American Association of Colorado, the National and Mile-High Chapter of the Japanese American Citizens League, Japanese American resource Center of Colorado, an instructor for the TS/DBT Karaoke Club and participates in the annual Kohaku Utagassen singing contest. In this retirement, Richard enjoys golf, poker, bridge, wine making and participating in an investment club. Richard was born in Salinas, CA and was raised primarily in Fort Lupton, CO and Waianae, Oahu, HI. After earning Bachelor and Master’s Degrees in Electrical Engineering from the University of Colorado, he spent his entire career as an engineer with Lockheed Martin, retiring in 2006. Richard worked on many classified projects including the space shuttle, and was Chief Engineer for the High Energy upper stage of the Titan Rocket. In 2003, Richard joined the Tri-State/Buddhist Church Apartments Inc. (TSBCAI) board, sparked by a keen interest in continuing to develop, maintain and sustain the Japanese heritage and culture in the Lower Downtown area. Richard is down-to-earth and finds it easy to discover goodness in everyone. Given the chance, he feels everyone has the potential to accomplish great things, which why he has a very optimistic outlook for Sakura Foundation and for the JA community at large. He hopes feels Sakura Foundation is forward-thinking and that the future holds great things if the community has a positive attitude and works together. Kelly finds great personal satisfaction in being a part of the JA community. As the current chairperson of Sakura Foundation’s Mirai Generations Leadership Program (MGLP), she feels the MGLP is making a difference to ensure a strong future for JA community. Kelly is a native of Chicago who moved to Denver in 1990. After earning a business degree from Wharton School of Business, University of Pennsylvania, she studied Architecture at the University of Illinois. She is still at the same architectural firm in which she began her career, OZ Architecture. Kelly has been a Principal of the firm since 1997 and has been on the Board of Directors for the past few years. She specializes in educational design and has been on the board of the A4LE local chapter for seven years, currently completing her tenure as chapter President. Kelly was chosen in 2019 as a member of the Japanese American Leadership Delegation (JALD) program, which provides the opportunity for a select group of JA leaders from across the United States to travel to Japan to engage with Japanese leaders in the business, government, academic, nonprofit and cultural sectors. The program is sponsored by the Japanese Ministry of Foreign Affairs with support from U.S.-Japan Council. Once her two sons became teenagers, she became more involved in the JA community, joining the Sakura Foundation Board in 2014 and the Sakura Square LLC Board in 2016. Kelly is a member of Tri-State/Denver Buddhist Temple and designed the Temple’s Nokotsudo, a special area for the storage of ashes of loved ones. 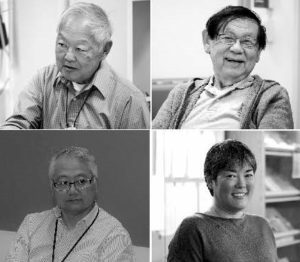 Rob finds it rewarding to work with such a diverse, successful and caring group of board members and play a role in planning the future of Sakura Square and the Temple. The continued success of Sakura Square, the Temple and the JA community has always been important to Rob, given the huge sacrifices the Issei and Nisei made to establish and maintain Sakura Square and the Temple. Being on the Sakura Foundation board allows Rob to continue this tradition and help the JA community become a more active and vital part of not just a regional or national, but a global economy. At the invitation of former board member and good friend Steve Shigaya, Rob joined the TSBCAI board in the early 2000s. Because of his family history with and his own interest in Sakura Square, the Temple and the JA community, Rob was excited to serve on the board and help build the future of the JA community through TSBCAI which would become Sakura Foundation. Rob was born in Longmont, CO and grew up on a vegetable farm (Tanaka Farms) in Boulder County. His is the oldest and only boy of four children. The families of mother and father were active in the Tri-State/Denver Buddhist Temple (the Temple) and the JA community. After graduating from the University of Southern California with a BA in Economics, Rob returned to Colorado to help on the family farm. After three years of hard farm work, he returned to school and earned an MBA in Finance/Accounting at UCLA and an MT in Tax from the University of Denver. He then worked for Ernst & Young (becoming a CPA) in the Tax area. After three years of public accounting, Rob worked in corporate tax departments for various companies. Since 2011 he has worked in the Large Business and International Division (LB&I) of the IRS as a Case Quality Reviewer and as a subject-matter expert in the Corporate Distributions, Liquidations, Reorganizations, and Adjustments Practice Network, assisting agents throughout the country in determining the income tax implications of various transactions/reorganizations. Prior to working for the federal government, Rob was on the board of the Tax Executive Institute (TEI), a professional organization for tax managers and executives in industry. Rob’s interests are, not surprisingly, taxes, as well as his two sons’ activities of judo and taiko, golf (he has golfed in the Go For Broke Tournament since 1978), old cars (he owns a 1959 Porsche 356A Cabriolet and a 1965 Ford Mustang Fastback), traveling (he has traveled to London twice a year for work) and spending time with his family.